An easy, savoury home-cooked meal of braised chicken in oyster sauce is all you need to have a taste of Chinese comfort food. The best parts of chicken to use are the wings and legs, as the texture is smoother and extremely tender when braised. This dish is saucy, aromatic and fragrant, and best eaten with plain steamed rice. 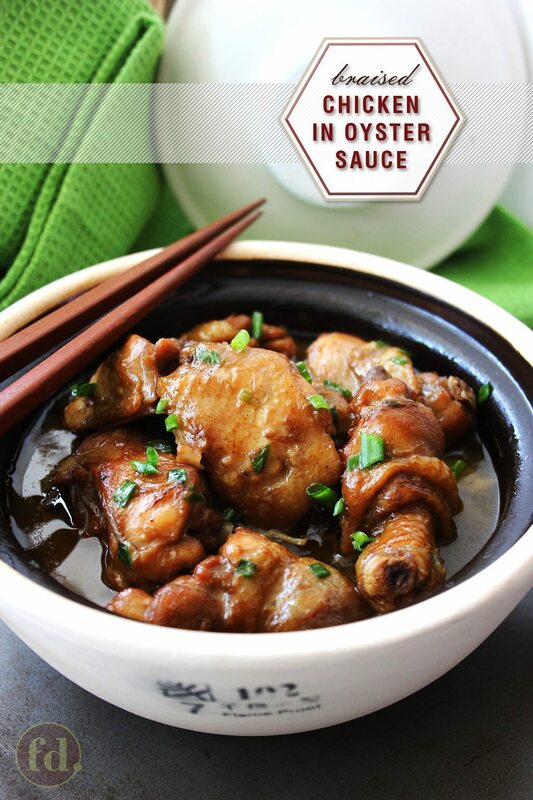 Have you found that you can cook almost anything with oyster sauce? Throw it into any meat, vegetable, rice or noodle stir-fry, and you’ll hardly ever be disappointed! Seriously, this dark brown, viscous, deep and intensely flavourful condiment made from sugar, salt, water, and the caramelised juices of slow-simmered oysters (oyster extract or essence), which is thickened with starch to yield its thick consistency, is indispensable in Chinese cooking. Every Chinese kitchen will likely have oyster sauce perpetually stocked, alongside light and dark soy sauces. I like to think of these as my essential trio of Asian sauces. 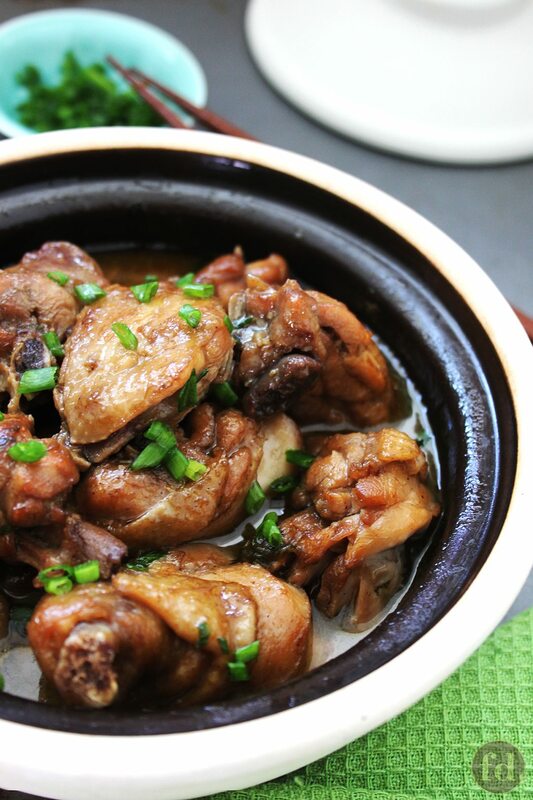 One dish that I particularly love and enjoy is this quintessentially Chinese dish of braised chicken in oyster sauce. It makes a simple, hearty and healthy (if you use skinless or lean cuts of meat) meal, delicious eaten with plain, steamed rice. I was reminded of this delectable dish when my fellow food blogger friend, Yvonne of Souper Diaries recently wrote a wonderful recipe post on braised chicken with mushrooms. 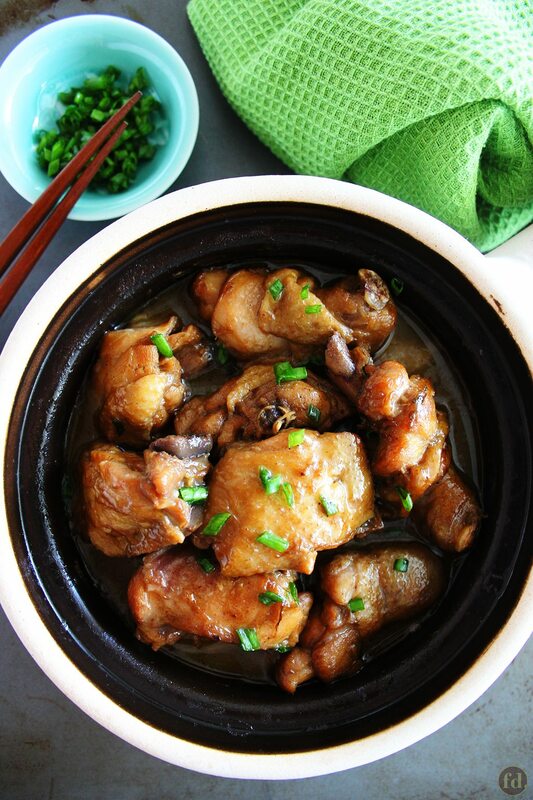 Braised chicken in oyster sauce is a classic example of Chinese soul food. It is more often savoured as a home-cooked dish. It hardly makes its way onto a Chinese restaurant menu these days, as restaurants increasingly put out their most popular and chef-styled signature dishes. I typically cook a lot of braised dishes, if you happen to notice, Cantonese-style braised chicken with potatoes, braised pork belly and eggs in soya sauce, Nonya-style babi pongteh (braised pork in fermented soy bean sauce) and Peranakan curries, being all my usual favourites. Braising is a style or way of cooking that favours slow and gentle heating over low, controlled heat, in a braising (stewing) liquid or sauce bath. Typically, braising is a longer cooking process, sometimes taking several hours, where meat, seafood and vegetables are slow-simmered with a flavourful mix of sauces, spices and liquids like stock or water. The sauce mix is essential towards the end flavour, usually comprising a mixture of light and dark soy sauces, often including as well, Chinese wine, various types of bean pastes, oyster sauce and other flavourings. Aromatic ingredients including ginger, garlic, galangal (blue ginger), spring onion, and spices such as cinnamon bark, cloves, star anise, ground spices and peppercorns, all add layer upon layer of flavours to the dish. Prior to cooking, the meat itself is usually seasoned lightly, but should be given time to absorb the seasonings before braising. Sometimes, a quick deep-fry in oil or stir-fry is essential to seal in the flavour and juices, before braising. The heady aroma and fragrance of a braised dish is unmistakable, and promises tender textured, juicy meat. Hardly any fancy garnishing is required, as there’s so much flavour to be had in the sauce. Chinese-style garnishing is simple, under-stated and takes nothing away from the main dish presented, usually just a sprinkling of chopped spring onions, coriander leaves or parsley will suffice. This braised chicken is a versatile and forgiving dish, which is why it’s really a favourite with home cooks. 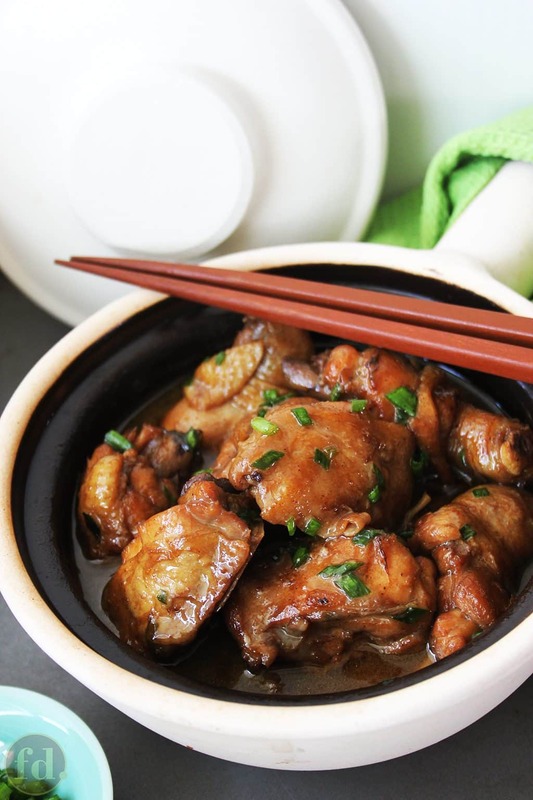 You can expand the flavour of this dish by braising the chicken with dried Chinese mushrooms (be sure to first soak in warm water until softened), potatoes, or chestnuts. I really like this recipe variation which uses dried scallops, as they enhance the sweetness of the sauce. If using dried scallops, try to use your best variety for this dish. You can use different cuts of chicken, though the favoured cuts are the wings and legs. These parts are favoured in Chinese braising because of the smooth texture of the meat, and for the skin (as unhealthy as it may be!) which soaks up all the umami flavour of the sauce. Chop each chicken leg into 3 or 4 chunks. Season with light soy sauce and pepper. Set aside for 30 minutes. Meanwhile, peel and slice ginger knob and garlic cloves. Cut the white part of spring onions into 1-inch lengths. Finely chop the green part for garnishing. Soak the dried scallops in warm water until softened, about 10 minutes. Drain, but reserve the soaking water. Shred the scallops finely. Heat up a wok over high heat with sesame oil until hot. Stir fry the ginger, garlic and spring onion (white sections) until fragrant. Add shredded scallops, and stir fry for 1 to 2 minutes. Put in the chicken chunks and toss until they change colour. Drizzle in the Chinese wine and stir fry briskly until well combined. Transfer to an earthen or clay pot (optional). Pour in the combined sauce ingredients and the reserved soaking water. Bring to a boil. Once boiling, cover the wok or pot with it's lid, reduce to low heat, and let braise until chicken is tender, about 30 minutes or longer, depending on your desired tenderness. When almost done, taste the sauce. If a more intense flavour is desired, leave the pot uncovered and allow sauce to reduce. As the water evaporates, the saltiness or sweetness of the sauce will also be intensified, so adjust to your taste by adding more salt or more sugar. Thicken the sauce with cornflour mixture to your desired consistency. Garnish liberally with chopped spring onions and serve immediately. Previous Post: « Oreo Cheesecake, Love at First Taste! Hi Lilian, if you are doubling the chicken portions, you can double the recipe including the ingredients for the sauce. You just need enough water (including mushroom water) to almost cover the chicken. You could always add water if the sauce reduces too quickly. How salty the dish will be depends on how much you reduce the sauce or gravy, so you may want to leave it to almost the end of the cooking to adjust the salt and sugar. If you find the taste is just right for you but the sauce is still watery, you can thicken with more corn starch solution till desired sauce consistency. Usually, I find more gravy is better than less.. ha ha. Hope this works out to your liking! If i were to use dried mushrooms instead of scallops how much water do i add in total? 3 cups (which includes the mushroom soaking water)? So can i make double the amount of sauce i.e. 2x the seasoning or will that be too salty? Or just adjust with salt & sugar at the end? Hello Liza, thank you so much for writing in and sharing your story. I’m so glad you found my blog too, and I was so delighted to hear how this recipe passed the test, especially with your children! Though I’m sure it’s due in no small measure to your enormous experience and expertise as a home cook. Congratulations! Your story just made my day that much sweeter! Hope you’ll keep sharing if you should try other recipes here, I’d love to hear your feedback! Have a wonderful week ahead! I’m Malaysian and i consider myself a very good home cook. I cook western, chinese, indian and of course malay dishes BUT my kids insist that my oyster chicken recipe is not as good as my sister’s. (A bit of jealousy creeps in – must outdo sister ?). So i have been trying her recipe and other online recipes for the last 2 years but to no avail. Still no good. So i stumbled on yours and voila – SUCCESS – two thumbs up. But it is so strange that the ingredients are the same, method is the same but to my kids its different. On a side note, i prefer shitake but my kids must have it with tinned button mushrooms. Thank you very much for this recipe, in my kids eyes, i’m finally a good cook. Hi Jean, mushrooms would really ooomph up the flavour of this dish! Yes, you can add it together with the scallops in Step 4?. If using dried Chinese mushrooms, you would need to soak them in warm water till softened, remove the stems, and use as whole or slice in half or as desired. Hope you like how it turns out, do share if you can!?? If I want to add mushrooms, when do I add them? In step 4, fry together with scallops? Hi Celia, I tried this braised chicken recipe today and it turned out excellent! As you know, I don’t really know how to cook and the fact that I can cook this succesfully just by looking at your recipe says something about this recipe. The chicken was very tender and delicous and it was so simple! Thank you very much! Thank you, Yvonne!? You’re most welcome, and I’d happily do so anytime, I love your blog and the yummm you cook up! We know it’s tough work ?, and you’re putting out great stuff!???? Hello Elaine, thank you for your lovely compliments which really made my day (I literally rushed like a joyful, excited, 40-plus year old lady..er..woman… that I am, to my hubby and had him read your beautiful message) and I am truly humbled!? I feel even more inspired today to keep at it (i.e. discovering and sharing good recipes) by your words of sincerity and encouragement. It’s tough work at times, but I truly enjoy it, and I’m blessed to have readers like yourself who take effort to let me know and shower this blog with comments and feedback, helping to nudge me along as I explore more of food. Thank you so much for coming along with me on my cooking adventures, ya! Happy holidays, Elaine! 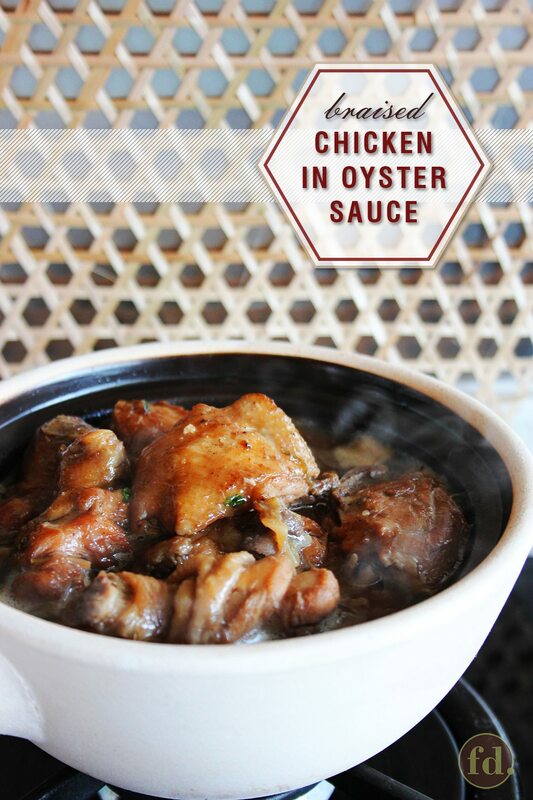 Hi Celia, I have long searched for the secret to a good oyster chicken dish and am happy to say, you have really come thru with this recipe…this recipe has finally fulfilled my every requirement of wt this dish should taste like ! I m an avid follower of yr blog as your sincerity in sharing yr recipes really show thru the many successful first attempts on my part. I look forward to yr many postings ! Hi Dennis, thank you so much!? Your words have just inspired me that much more to keep at this! Thanks for sharing, really loves your recipes. Keep on posting more frequently.